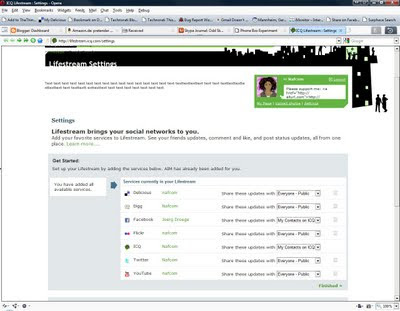 According to this post ICQ (who is owned by AOL) is also building Lifestreaming functionality. As discovered by my friend macxylo, the ICQ Team seems to be working on copying AIM&apos;s Lifestream service to ICQ now. The settings page is already there and Delicious, Digg, Facebook, Flickr, ICQ, Twitter and YouTube integration already works as it can be seen on my Facebook Wall, too me on Facebook. via Nafcom’s Crap Blog! : ICQ is working on ICQ Lifestream.